The October blog is up at www.1inchminisbykris.blogspot.com. 1 INCH SCALE KITCHEN CABINET FROM MAT BOARD - How to make a 1 inch scale kitchen cabinet from mat board. I never know where I'm going to find a piece of furniture I want to copy. This cabinet comes from a Die Hard movie, A Good Day to Die Hard. I love a good action movie, I love just about any genre of movie, honestly. Anyway, after "John's" son escapes from the courtroom and some car chases and crashes they all end up in a safe house. As soon as they walk into the apartment you will see this cabinet on the left side of the door. I wanted to make that cabinet and here it is. Use Nancy's patterns to trace the base front curve, the 2 cabinet door tops and the 2 corner brackets. Use the HOW TO RE-SIZE THE PATTERNS instructions in the "Things to do, Things to see" list at the left of the blog. Copy onto card stock to make sturdy patterns to trace from. Here are Nancy's beautiful patterns for you to follow, thank you Nancy! This is my drawing of the cabinet. I'm no artist, this is done with a ruler. 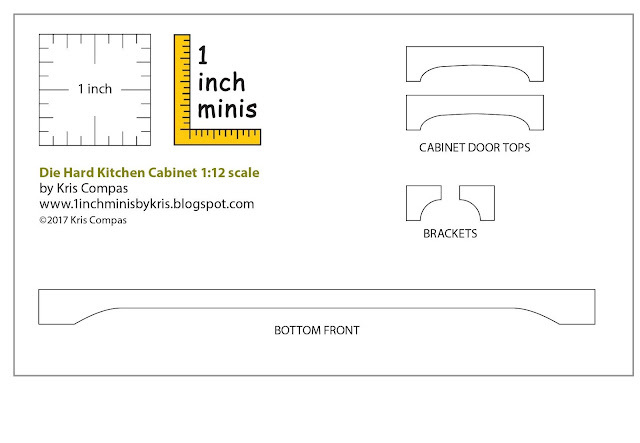 I draw the cabinet to scale to preview what it will look like and to get measurements from it as I cut. Throughout this tutorial I will be using yellow carpenter's glue. I want to have 1/8" thick sides, top and base parts so I am going to cut strips of mat board and glue them up ahead so they can dry. Cut 2 strips 1 9/16" wide x 20" long. Cut 2 strips 1 7/16" wide x 6" long. Cut 2 strips 1 1/2" wide x 6" long. Cut 2 strips 1 3/8" wide x 20" long. Cut 2 strips 1/14" wide x 6" long. Cut 2 strips 1 5/16" wide x 12" long. The lengths are an estimate, you will have some left over. You may also glue up shorter lengths as long as they are at least 6" long. Glue the strips together matching all the edges. Weight them down to dry. I am starting with the base. Cut a strip of mat board 3/8" wide x 20" long. From that strip cut 1 piece 5" long, this is the front; cut 1 piece 4 7/8" long, this is the back; cut 2 pieces 1 7/16", these are the sides of the base. I used my oval template, (Michaels) to draw an oval on the sides. I used an oval from the 30 degree column, the 15/16" one. I centered the oval on the mat board and traced it onto mat board. Cut it out and draw another on the other side piece. Use Nancy's pattern to trace the curve on the front of the base. From the 1 9/16" strip of doubled mat board cut a piece 5 1/8" long. Use sand paper to round the top edge of the base. Round 1 long edge and the 2 short sides. I used 180 grit, if you have 220 grit that will do just as well. Only sand the top edge round. Turn the base top over. Have the flat edge, (the back edge) facing you. Glue the 4 7/8" long piece to that edge, center it, leaving about a 1/8" on either side. This space is left for the sides and some overhang of the top. Glue the 2 sides on. These are glued covering the short ends of the back. Glue the front on. The front will cover the ends of the sides. Cut from the 1 3/8" wide doubled mat board 2 pieces 5" long for the sides. Cut the back from a single layer of mat board 4 11/16" wide x 5" tall. I want to make the back decorative, a little like bead board. I've measured along the top and bottom and made marks 3/16" apart. I am using a small stylus to press lines into the mat board. Press hard but not so hard that you tear the paper of the mat board. I ran the stylus down along the ruler a couple of times to make a deep impression. This is my whole back finished. I've cut the 2 sides for the cabinet from the doubled mat board. Cut a top and bottom from single layer mat board 1 1/4" wide x 4 11/16" long. Glue the top and bottom onto the face of the back. Glue the sides onto the side of the back and the ends of the top and bottom. NOTE*** your top and bottom will be 1/16" shorter along the front. I changed this after I was a little further along. Measure from the outside of the left of the cabinet over to 1 3/8" and mark. Cut a divider from the 1 5/16" wide doubled piece of mat board 4 7/8" long. Glue that into the cabinet so that the left edge of the divider is on the 1 3/8" marks. I used my square to straighten things up. Showing where the divider lines up. Center the cabinet onto the base with the backs even leaving extra along the front and side edges and glue together. Let dry. Position your ruler on the top of the base and measure and mark at 2" and 3 3/8" on the divider and the right side of the cabinet. Cut out a shelf from the 1/1/2" wide doubled mat board to fit between the divider and the right side of the cabinet. The shelf should be 3 9/16"long.. I have a notch cut on the right side. I cut a 1/8" off the length to fit between the divider and right side. Please trial fit this, it's better to have to cut a little more than have it be too short. I left a 1/8" on the front edge to overlap the front. This edge is rounded off just like the top of the base. Cut from the 1 5/16" wide doubled mat board a bottom to the top cabinet, this should measure 3 7/16" but please measure your opening to be sure. Glue this in on the 3 3/8" mark, do you see that the top of the board is at the mark? Square it up. Glue in the shelf with it's top on the mark. Do you see the right hand side of the shelf how it is in front of the right side? I have painted the inside of my cabinet. Really didn't need to paint the inside of the long and bottom cabinets but I did. Cut some 1/8" wide strips from card stock. Glue the strips onto the cut edges of the doubled mat board. Now the edges look neater. At this point my measurements are an approximate. Please measure your spaces to be sure of the measurements. We all measure and cut differently and a 1/16" can mean a lot in miniature. Cut from 1 1/4" wide doubled mat board 2 pieces 1 13/16" tall. These are glued under the shelf, please measure the space to be sure of the measurement. Here they are glued into the cabinet under the shelf. Measure and cut a single layer of mat board to fit into the space under the shelf. This piece fits INTO the hole, even with the divider and side. Glue it in. You will remember that I told you earlier that the bottom and top of the cabinet was a 1/16" narrower than the picture showed, this is why,so this piece can fit INTO the space. Measure between the left side and the divider and from top to bottom of the long cabinet on the left side. Cut a single layer of mat board to fit into the space. Glue the mat board into the space. I use Filbert brushes to paint with, that refers to the shape. They have rounded sides that help with not leaving lines from your brush strokes. A tip from an old decorating book, get your brush wet with water (if using water base paint) before dipping into the paint, this keeps paint from clogging up at the metal ferrules. Cut from the 1 7/16" wide mat board a piece 5 1/8" long. Cut a 1/8" wide strip of card stock and glue it around this piece. Cut from the 1 9/16" wide doubled mat board a 5 5/16" long piece. Sand one long side and the 2 short sides round just like you did for the top of the base. With the back long sides even and extra on the front and sides glue the 2 pieces together. I've painted the front of the long and short cabinets. Just trial fitting the top, I haven't glue that on, yet. Measure from the right side 1 9/16" and mark. This area will be painted your main color, mine is red. Cut a strip of mat board a 1/8" wide. I know mine is wider, I made a mistake that I take care of in the next picture. You measure between the divider and side and cut your 1/8" wide piece to fit into this space. You see, I had to cut this piece to fit the arches in my cabinet doors. Cut your strip a 1/8" wide and glue it into the space between the divider and the right side. I am painting my cabinet. Cut from single layer mat board strips 1/4" wide. Measure and mark as I have onto card stock. Mark a line down the center. I am making the bottom cabinet doors. They are made from 1/16" thick mat board with no gluing surface to speak of. I came up with this idea for making the doors so they wouldn't be flimsy. Measure and cut the 1/4" strips to fit as I have in the picture. Glue them together and to the card stock. Draw a rectangle for the long cabinet, 1 3/16" x 4 15/16" and for the upper cabinet, 3 17/32" x 1 21/32". Measure and cut the 1/4" strips to fit and glue them together and to the card stock. Use Nancy's pattern for the tops of the upper cabinets. After the doors are good and dry cut them from the card stock. Cut out the card stock in the center of the doors, too. I have them laying on the front of the cabinet. I am painting my doors. Use Nancy's pattern to cut the 2 corner brackets from mat board. I've glued the top on and have it clamped. The corner brackets are glued in. For the knobs I am using some nails I have on hand. I am going to mix black paint with the carpenter's glue to round off the tops. I will have to go back and apply the mixture again because the glue will dry and shrink. Then I will paint the rest of my knobs black. After I painted my doors I found that I wanted the outer edge to be softened, not so square. Being that I glued the pieces onto card stock all I had to do was hold the doors along the edge of my table and sand the edge just a bit. I repainted my doors and glued them on. I am using weights for the long door. Measure the space between the cabinet doors and the right side for the drawer fronts. Leave a 1/16" or a little more between the cabinet door and the drawer fronts. Leave the same amount on the right side. Cut that width from a single layer of mat board. Cut your drawer front the widths that I have in the picture. Round off the four edges with sand paper. I've dabbed on some more black paint and glue mixture. Letting them dry. The knobs are painted black and drying. For the "glass" I use acrylic from poster frames. These frames are from Walmart and come in different sizes so you don't have to buy a large poster size frame. The acrylic can be cut with a craft knife. Cut the acrylic to fit the upper cabinet doors and glue in with tacky glue. I've weighted the acrylic down to dry. The drawer fronts are glued on. I've drilled holes for my knobs and glued them in. I have attached the upper cabinet doors with sticky wax from Hobby Builders. I can get back into the cabinet to change things around if I want to. You might ask why I didn't make everything open and close. I thought making the cabinet like this would make it more accessible to more miniaturists. Besides, who's to know they don't open and close once it's put into a scene? I hope you like my "Die Hard" kitchen cabinet and will take some time out to make it and send me a picture for the Follower's Gallery.